This is the last blog in my series about lamp posts. The Animal Kingdom, the newest of the Disney World parks, has a number of custom made fixtures worth your attention. As in previous articles, I’ll begin this tour in the parking lot, were we find a utilitarian fixture that is unremarkable at best. The Animal Kingdom usually closes before the sun goes down, but on those occasions when the park is open late, these tall giants help us find our cars by not only illuminating the ground below, but also by marking the section where we parked our car. Near the bus loading and unloading area are these simple fixtures. Banners help spruce up otherwise unremarkable lights. It’s not until we arrive at the tram loading area that we get our first taste of the fun lamps that populate the Animal Kingdom. If you look closely at these lights, you can see the park’s logo created out of metal and glass. The Oasis acts as a transition between the outside urban world and the land of nature and animals. In keeping with this natural theme, two bamboo styles of lampposts are used in this area. Discovery Island was designed to tie all of the other lands of the Animal Kingdom together. In this “center” land, you can find a multitude of animals in all shapes and sizes. But the Imagineers didn’t want to convey any specific area of the world as this would detract from the other sections of the park. So they created a playful atmosphere – an almost cartoon-land of animals. This design lends itself to some of the most entertaining lampposts at Disney World. 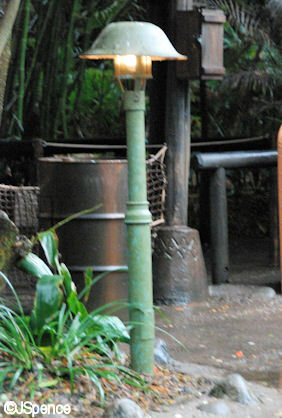 This first lamp is the “basic” fixture of Discovery Island and can be found throughout the area. In front of the Disney Outfitters store we find this whimsical lamppost. The top is adorned with an owl while the entire pole is supported on the back of a turtle. The Island Mercantile store was themed with animals that “work.” So it’s fitting that outside the shop we find elephants holding lanterns in their trunks. In front of Pizzafari the lampposts have large butterflies resting on top of the light. This makes sense since moths are drawn to flames. And while you’re in the area, be sure to visit the inside of this restaurant for more interesting theming. Each of the four dining rooms displays animals grouped together by their similarities. See if you can figure it out. In front of the Creature Comforts shop is this amusing ladybug lamppost. Once again, this is appropriate since this store is themed with animals featuring spots and stripes. Over near Flame Tree BBQ are more fanciful lampposts. The first fixture features a spider and her web while the second displays another owl, but this time, we find bunnies on the lanterns. At a first glance, the tower in the next picture looks like nothing more than ornamental decoration. But upon closer inspection, you can see the brightly colored banner actually houses a light. Be sure to take a moment and look at the intricate carvings on this pole. Numerous animals have been meticulously sculpted onto its surface. As you might already know, Camp Minnie/Mickey was originally built to be a “place holder” until the corporate budget could afford to build Beastly Kingdom, an area featuring mythological animals. At that time, Camp Minnie/Mickey would be razed to make room for a mystical land filled with fabled creatures. I think these existing light fixtures tell this second story far more effectively and perhaps the Imagineers always planned to reuse them in Beastly Kingdom. Hmmm. On the bridge leading into Africa and Harambe we find this double-fixture leading the way. Much of the lighting in the central marketplace of Harambe comes from overhead fixtures strung across the street. It’s not until you leave the village and enter the outskirts of town that you find a smattering of lampposts. Most of these are simple and makeshift as much of Africa is poor and expensive fixtures would be out of the question. One would assume that these next two, more elaborate examples, were brought to Harambe by Europeans during the colonial years. There are no lampposts on the Pangani Forest Exploration Trail. This area is a nature preserve where scientists and students observe animals in their natural habitat. The last thing you would want to do in this environment is draw attention to yourself so the trails were intentionally left dark. There is a long pathway that leads from Harambe, Africa to Anandapur, Asia. As you would expect, the lighting changes as you leave one area for another. The first picture is on the African side and the second on the Asian. On the bridge that leads from Discovery Island into Asia we find this next lamppost. It has a decided Thai design. As we enter Anandapur we see a number of rusting electrical towers. Attached to these are neon fixtures. As we venture out of town, the metal towers give way to a more traditional wooden pole to carry the jumble of wires and lighting fixtures. A few ornamental lampposts can be found scattered around the area. Guests enter the Kali River Rapids attraction via an elaborate temple. As no expense was spared when building this opulent structure, it makes sense to find ornate lampposts were incorporated into the design. There are no lampposts along the Maharaja Jungle Trek. The only lighting here comes from stone lanterns that line portions of the path. Our next stop in Asia is Expedition Everest. As the setting here is in the high plains that surround the Himalayan Mountains, resources are scarce and money is hard to come by. Most of the structures are makeshift and the lampposts are no exception. Near the more populated area surrounding the booking office and temple we see light fixtures hanging from electrical poles. As we venture further away from civilization, kerosene lanterns become the main source of lighting – including that Coleman lantern that I think should be found in Camp Minnie/Mickey. Our final stop in the Animal Kingdom is Dinoland USA. One must remember the backstory for this land in order for some of the posts to make sense. Before prehistoric bones were found in the area, there was little here except an old hunting lodge. Because of this, lamps are simple and rustic as can be seen by these next two examples. This next fixture adorns the walkway leading to the old lodge. Years later, when fossils were discovered and the Dino Institute was built, the areas around the digs were provided with more up-to-date lamps and the institute was given a fixture appropriate to its stately architecture. Along the road that separates the Dino Institute from Chester and Hester’s Dinorama, lampposts typical of many highways can be found. There are no lamppost at Chester and Hester’s. All of the lighting here is provided by dozens of bare light bulbs strung overhead. Outside the Theater in the Wild is this modern lamppost. It fits appropriately with the building’s contemporary architecture. Well that’s it for my lamppost blogs. I hope you’ve enjoyed my tour of these lighting fixtures around the four parks of Walt Disney World. As I said in my first blog, there are numerous other lighting options that are every bit as interesting and themed appropriately to their surroundings. My main objective in writing this article was to help open your eyes to the many details that surround you when you visit this magical place. Little things we take for granted and don’t even notice, play a part in our overall enjoyment of the parks. Who would have thought that lampposts could be interesting? Next time you visit, pick a topic. Check out doorknobs, or fences, or windows — anything you like. Then pay attention as you move from land to land and park to park. You’ll be amazed at what you discover. I’ve been going through your blog archives lately and this series is definitely a gem! I absolutely love the little details that ‘make Disney Disney’–there are so many things that a lot of people over look while they’re rishing to their next attraction. From time to time its great to slow down and look for those hidden surprises. On to reading about park benches! I have enjoyed these articles tremendously. A tip for anyone who has never been to AK after dark – try to do it sometime. You won’t see animals, but Mt. Everest and the Tree of Life are totally different fixtures when seen lit up at night. I recommend a 5 pm dinner reservation at Tusker House, then take your time leaving the park. You’ll be glad you did. Mr. Jack, your articles never cease to amaze me. Your tallent for picking obscure things and making them fasinating is wonderful. Well done Sir. Great post! There’s another light I’d like to add to your list. It is at the main entrance to Pizzafari, off the main path (toward Harambe). Just outside the double doors, look up. There is a porch lamp with moths flying around it. Talk about detail! This lamp is probably my favorite, probably because I just happened to look up one time and noticed it. I love all the little story-telling details throughout the parks, but AK is my favorite! Thanks for your hard work on this four part series! Like the benches around the World, I enjoyed reading about the different lamp posts around the various parks. The details in all of them are astounding, especially in AK. Epcot’s World Showcase lamp posts were interesting, too. But, I find the lamp posts in Camp Minnie-Mickey most intruguing. I sometimes wish the land of Beasts would have come about. Dueling Dragons is too fun and Disney would have done something special with it, I’m sure. Love this!! Benches and now lighting 🙂 I am a huge WDW fan and these bring me right back to the parks and give me some fun facts to observe the next time we go. Thank you! I am amazed at what I have not noticed. Although, I have only been at one park, the MK, one time after dark and that was at MVMCP – no time to gawk at lamps. It boggles the mind as to the number of different lamps there are. WOW! The spider lamp is amazing! I will look for it the next time we visit AK! Excellent, as always. Such a wild assortment of fixtures must drive the maintenance folks crazy. The third lamppost in the Harambe series appears to be a stack of iron plumbing connectors topped by a dishpan. I might try that one at home. Yep, I’m with all these previous posters. Animal Kingdom has perhaps the best theming of all the Florida parks. I absolutely love the theming and fixtures around Discovery Island. Every time I’m at Animal Kingdom, I love it even more. Thanks for the informed and interesting tour! thank you, jack! you answered a question that’s been playing in my mind for 10 years: why is there a dragon in the AK park logo? apparently it’s because of the beastly kingdom of fantasy characters that is now camp m/m. so there’s hope that the fantasy kingdom will happen?!?!? maybe it will be led by figment! great work, as always! Jack, I’m so impressed by your research & patience in writing these blogs. Thanks for your diligence in providing the rest of us with our Disney fix. The pictures are fantastic! Going back to the bench blog, the cutout on the tram-loading area lights (3rd from top) used to be on park benches in AK. The lion, elephant, dragon, triceratops, and whatever it is were cutouts on the bench back. I wish they’d get around to incorporating the Beastly Kingdom idea into the park like originally planned. If only Disney had been the one to make the new “How to Train Your Dragon” movie instead of Dreamworks. That would have been the perfect tie-in for AK! A very enjoyable series of entries. The Animal Kingdom has been my favorite for unique lighting from the day it opened. Well done! Thanks very much for creating these posts! I am one of those “attention to details” people and I have always noticed the different and intricate lights that exist around “the world”. My family has always thought I was crazy as I stood there taking pictures of the light posts, so I’m very glad to hear that I am not the only one! Just wanted to drop in and say that I love these articles Jack. Details like this (the Disney difference) are what keeps me coming back. I have to say that AK is my fav out of the four parks for lighting, there just seems to be alot more details in all the lighting!! It was a great series and I really enjoyed reading them all! Love your idea of picking a topic then setting out to all four parks! Job well done, thanks for sharing!!! THANK YOU! Jack, you really do such a marvelous job of helping me to enjoy all the little things that make Disney so magical. great finish to a great series. This I would have to say was my favorite blog out of the four. I never noticed how much detail went into all the lights and their surroundings. can’t wait for your next blog and as always keep up the great work. Animal Kingdom wins! AK has some of the best lamp posts and I never noticed them so now I will be really looking for all of the neat AK lamp posts. I have to tell you that you have made me more aware of my surroundings here in my small town! I have been checking out lamp posts now but so far none have been as interesting as the ones you find at WDW. Jack, this series was even more impressive than your bench series. I’d noticed some of the interesting lampposts in Animal Kingdom, but had never thought to really pay attention to the lamps in the other parks. Thanks for again giving us a whole new way to enjoy Disney! Hey Jack, great job once again. You didn’t mention Rafiki’s Planet Watch but I would assume that since it closes so early, there is no need for lights. Still, if you noticed, it would be great to follow-up with. Thanks, Jack! I enjoyed the “around the world via lamppost” trip. What fun! Must say, I think the Animal Kingdom has the best themed lampposts! Wow!! Out of all four this one was by far my favorite of all on the lamposts! I enjoyed the others but these have a lot more going for them! Great! thx. The picture of the second “Colonial Lamppost” (http://land.allears.net/blogs/jackspence/AK%20Lamppost%2023.jpg) appears to be a WW1 British Steel “Brodie Helmet” mounted on a pole. Its just a little detail I specifically noticed on my last trip. I’m still awake! 😉 Absolutely fascinating! I’m very sad to say I’ve never set foot in AK in the dark, but I do intend to on my next trip. Thank you for my ‘walk’ through the parks I had fantastic fun! I have been to WDW over 15 times and have never noticed the many different lampposts before. Thanks for opening my eyes. Next time I will keep a lookout for details.